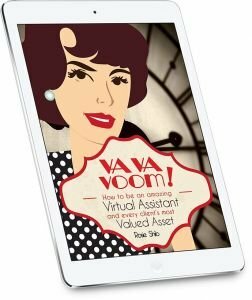 You can now purchase VA VA Voom: How to be an amazing Virtual Assistant and every client’s most Valued Asset as a downloadable eBook! Yay! This gorgeous eBook includes heaps of advice about setting up your virtual assistant business and what to consider to ensure you are working with the right clients and getting them to LOVE you for your AWESOMENESS! It is a book and manual in one – activities are included to help you along the way. Feedback and tips from many business owners are included so you know EXACTLY what they are looking for in an awesome VA! Va Va Voom was such an easy read when I started my business – I felt like Rosie was chatting to me and understood how it felt to be me and exactly what I needed to know for my business and my confidence to grow! Well worth it! Thanks! I read the eBook in one sitting. Lots of tips and useful information for me at this point in time with my business. It has given me more motivation to build a more successful VA business. I loved this book. I received my book yesterday and have been madly reading, great job, well done. Its amazing! Great book and a wonderful resource – you must feel elated that the people who need this now have it perfect their their VA journey. I opened my VA Business almost 5 years ago and think I helped inspire Rosie to write this book! I bugged her with so many ‘how to’ questions which she patiently answered. New VAs should snap up this book – it’s brilliant and answers everything you need to know. Don’t hesitate, just buy it. It’s the best value start up book you’ll find. Well done Rosie, very proud of you. It’s a fabulous book Rosie! I would highly recommend any new or aspiring VA to grab a copy. Not only is it a great resource full of tips and ideas but it will keep you motivated into the future. Well done Rosie! Thanks so much Rosie, I’ve only been in this business a couple of months so there’s still a lot for me to learn! I’ve only skimmed the book at the moment but I can see there’s so much I’ll be able to take away. Will enjoy the read!